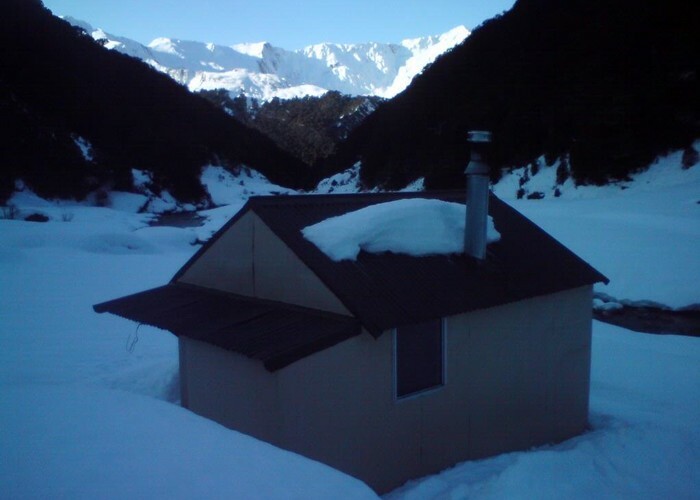 A cozy but spacious 4-bunk hut in the Camerons Creek valley off the Makarora - taken late July 2011. Accessible most easily up the Camerons Creek via a tramping track. There's one crossing of the creek which stopped us on out first visit - if you've seen the waterfalls below you'd understand why we'd not chance it! A good number of people make a loop trip by climbing from the hut over Mt Shrimpton and down to Makarora West on the Mt Shrimpton track. This is also (according to the Wilderness Magazine left in the hut) the fastest route into the Hunter via an easy pass into High Burn. Hut book comments suggest that although the pass may be easy, the gorged valley and bush-bashing required to reach it from the hut are not, so don't believe everything you read! Added 31 July 2011 by madpommadpom. 3 revisions, most recently 31 July 2011 by madpommadpom. 79 views in the past year (7 per month).